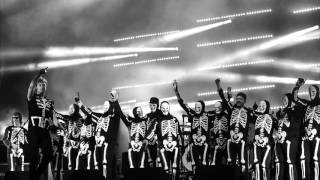 Kasabian have shared a spooky surprise for their fans this Halloween. Kasabian have shared a special cover of The Addams Family theme song for Halloween. The Leicester band gave their fans a treat today (Friday 30 November), to get them in the mood for this weekend's frightful festivities. The video, named The Meighan Family Values, was uploaded to their official YouTube channel with the message: "A little something for Halloween 2015. Hope you enjoy it!" Fans are pretty impressed by the cover, which replaces "the Addams family" with "the Meighan family" (frontman Tom Meighan's surname) in the song. This isn't the first time the Eez-Eh band have covered a ghoulish track, also tackling on the iconic Ghostbusters theme song.